When gaming gets serious, you need guaranteed: performance, reliability and uptime. With MelonCube's dedicated servers, we provide you with full control over your system, from selecting an operating system, to configuring using root (SSH); you've got the power. We deploy only the highest quality servers built on enterprise Supermicro® chassis and Intel® processors. Whether you need one server, or one thousand, we've got you covered. You can tap into the same systems that power some of the world's largest Minecraft server networks. Protected by our enterprise DDoS protection of up to 100Gbps with automatic mitigation systems which allow us to guarantee unbeatable uptime! We offer a wide range of versions of the most popular operating systems, ensuring a good chance that we'll have one that you need! Otherwise, you can install your own. Upon order, you can edit and customise the configuration of your server. This allows you to choose your hard drives, RAM, IP addresses, operating system and more! All MelonCube dedicated servers come with at least one dedicated IP address. You can choose up to 256 add-on IP addresses for use with a single server, billed at a low monthly fee. We can install Multicraft for you, and provide full access to the administrator console and account to allow you to make the most of your dedicated server. We don't have any type of contracts, pay monthly, quarterly, semi-annually or annually and always have the option to cancel whenever you want! You will get reminders about due dates. For advanced users: We support 64-bit and 32-bit versions of all major operating systems inlcuding, but not limited to: CentOS (5, 6 & 7), Debian (7 & 8), Ubuntu (12.04, 14.04 & 16.04), FreeBSD (12 & 13) and Windows Server 2012 (Standard or R2). Optionally, you can install your own operating system (eg. CloudLinux or Fedora). The chances of your server being targeted by a DDoS attack are great and attempts are numerous. All MelonCube Host servers will benefit from automatic DDoS mitigation (reactive mitigation) as a standard in the event of an attack. 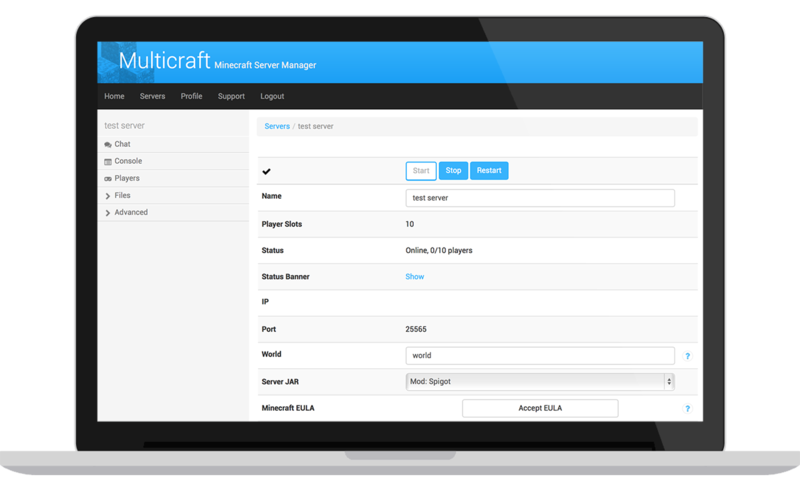 Multicraft is a feature-rich and ever-evolving control panel that gives you flexible control of your Minecraft server from a single dashboard that works on desktop and mobile. support team here to help! Your servers don’t sleep and neither do we. We staff our Network Operations Centers around the clock to ensure that the network is running top notch and that your servers are delivering content to your players and clients when they need it the most.